In its one-year operation the 1st Air Calvary Division's Kodiak Quarry has produced over 100,000 tons of rock. That's enough to build the Empire State Building twice over and have enough left for Grant's Tomb, or 60 miles of four-lane super highway-complete with cloverleaf overpasses. But Kodiak's yield is more concerned with heli-pads, runways, billets' foundations and road repairs rather than skyscrapers and turnpikes. 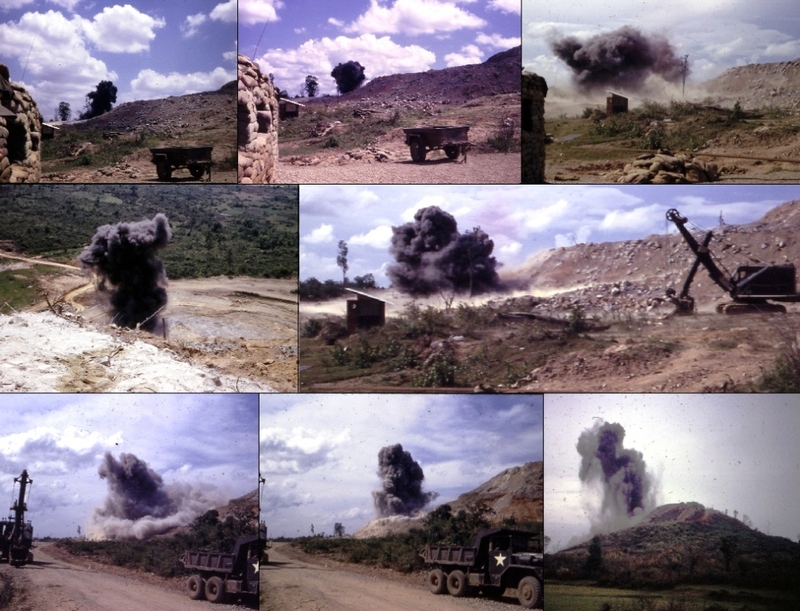 "There are very few building projects in the CAV that don't have some of the rock taken from this quarry in them," says Lieutenant Don Atwood, company commander of Alpha Company, 70th Engineer Battalion, the quarry's keeper. "The division is quite fortunate that a site like this exists near our base camp operation," Atwood, Westminster, Calif., adds. The Officer Candidate School engineer graduate estimates that it would take the majority of the division's vehicles, working 24 hours a day to import the amount of rock produced at Kodiak. 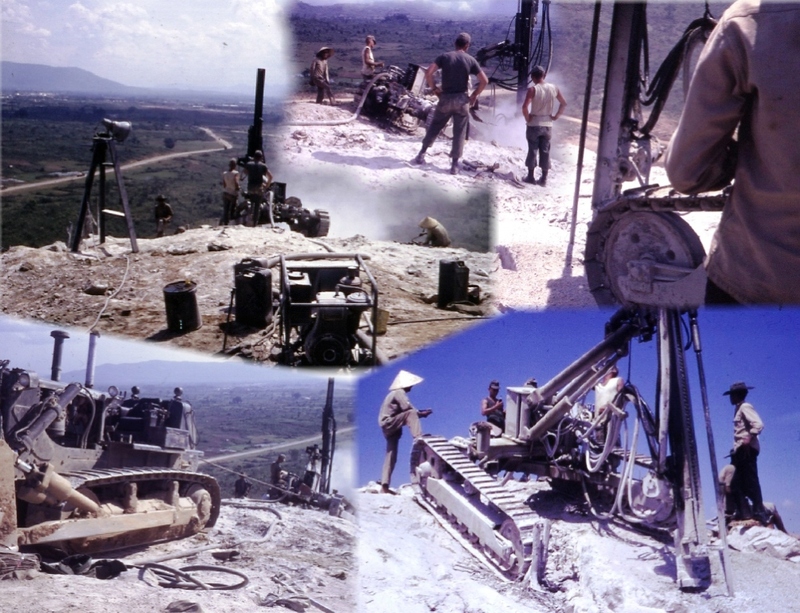 The operation is one of eight"suitable" rock quarries in Vietnam. "Because of its characteristics," Lt. Atwood explains, "Kodiak is probably the best in Vietnam. It has a very high grade of rock," the engineer says, "and, although our production is slowed during the monsoon season, it is not shut down completely." The majority of the other quarries in Vietnam - including the other two in the Central Highlands are at Pleiku and Qui Nhon - are forced to shut down during the rainy season because they fill up with water. Kodiak is an "open face" or "up" type quarry. Rock is extracted from above ground level. Most quarries are classified as "pit" operations digging down to get their yield. "The monsoons do create some problems for us, however," Atwood adds, "They make it nearly impossible to get our trucks up to digging sites to haul the rock out. The inclines are all pretty steep and during wet weather even our bulldozer has trouble making it." To combat this problem the engineer group is building three "benches" or roadways around the rock source that will make trucking movements possible even during the monsoons. "We have planned a 30-foot shelf at the top, a 20-foot one in the center and a 40-foot at the bottom," Atwood said. Presently most of the hard granite substance taken from the site is on priority order for the new air strip at An Khe, the largest U.S. Army constructed airfield in Vietnam. "This rock is the only type suitble around here that will meet the airfield's specifications," Atwood says. "Runways have to have a high strength rock to withstand the great pressure of an aircraft's landing." Captain Lee Nataluk, the mineralogist for the 70th Engineers, says that Kodiak's rock will withstand more than 30,000 pounds per square inch, exceeding the specifications for even the heaviest of aircraft. A total of 19 men work at the site. 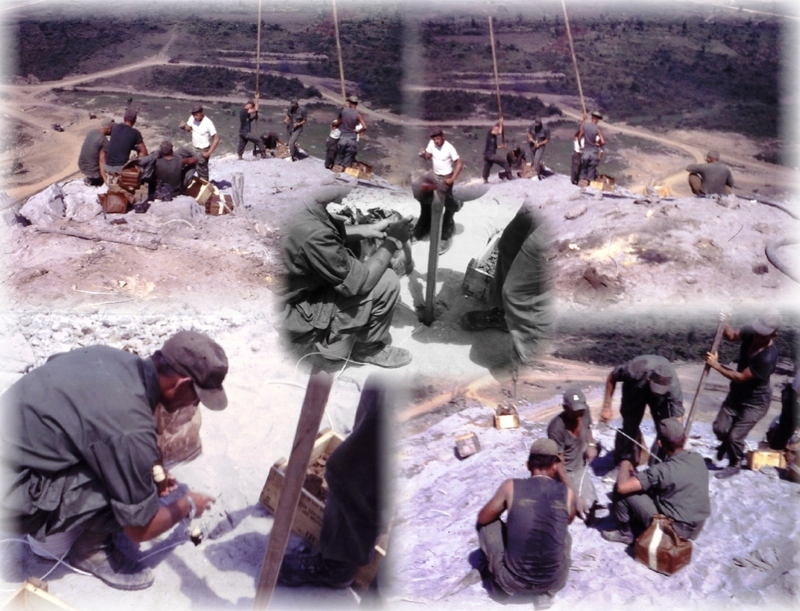 A four-man crew work at night drilling holes for shape charges, TNT and dynamite in order to keep pace with the rock removal operation during the day. "We drill about 40 holes daily, depending on depth," says Sergeant Leon Wise, Sampson, Ala., the unit's demolition expert. "Most of them run about 10-feet deep but we have drilled some as deep as 40 feet for a very large charge." "We've been working 24 hours a day for the last six months," Atwood says. "all in all this quarry has worked about 475,000 man-hours without an accident and we're as proud of that record as we are of our production levels." In order to work at Kodiak it appears you have to have more than just qualifications as a combat engineer. "It seems that everytime we get ready to blast, one of the local Vietnamese will drive his livestock across the area so we have to hold up, play Asian cowboy and help him move his herd out of danger," Atwood says. "Then there's the problem of getting up and down to the digging sites," Atwood adds. "We have leveld out a couple of the approaches but it's still a pretty wild ride at 45 degree incline - especially coming down with a three or four ton load of rock. But we are all optimistic around here." 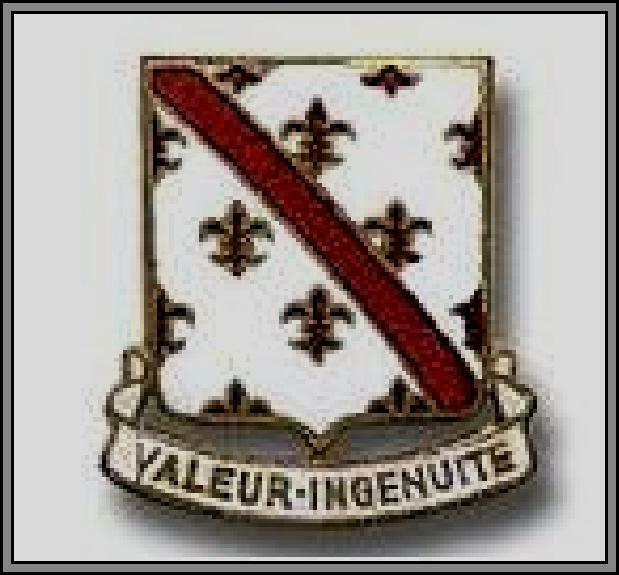 The quarry was originally opened in August of 1966 by Alpha Company of the 84th Engineer Battalion. 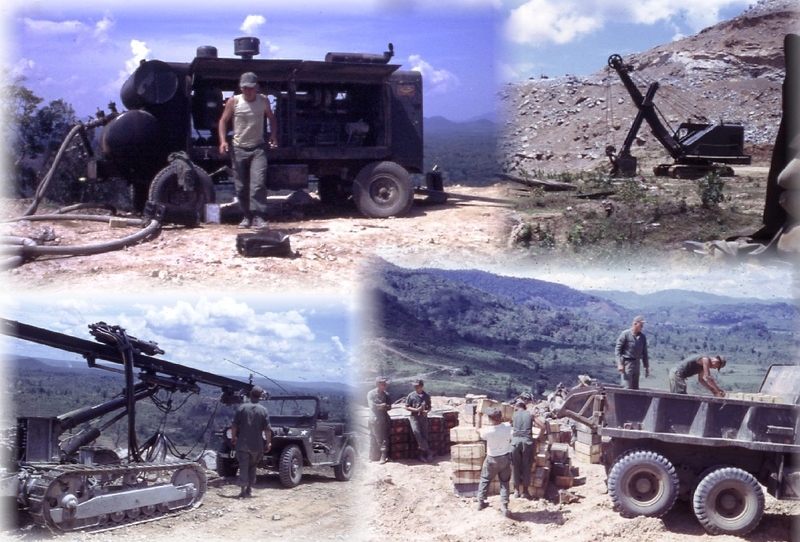 All of the rock taken from the site is sent to the An Khe crusher, manned by sister unit, the 630th Engineer Company, where it is made into cement.